How Much Water Can a 100-Foot Garden Hose Hold? 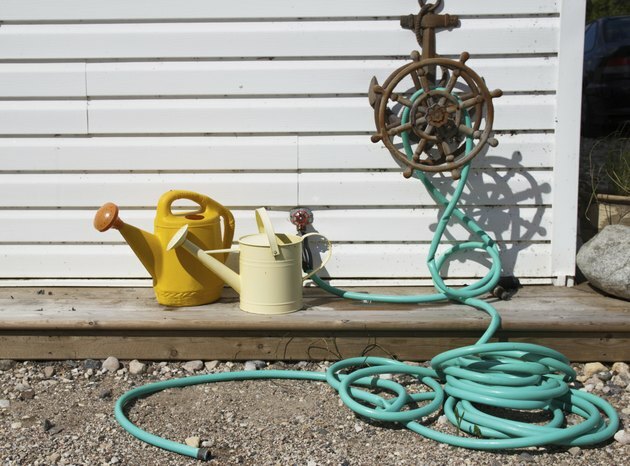 Whether you have a 1/2-, 5/8- or 3/4-inch garden hose, you might be surprised how much water a 100-foot length holds. That water remains in the hose when you turn off the tap, and if you live in a drought-prone area, you can put it to good use instead of simply letting it drain out. It helps to know how much water it holds so you can plan the water use. You'll need to measure the hose thickness, which tells you the inside diameter of the hose. 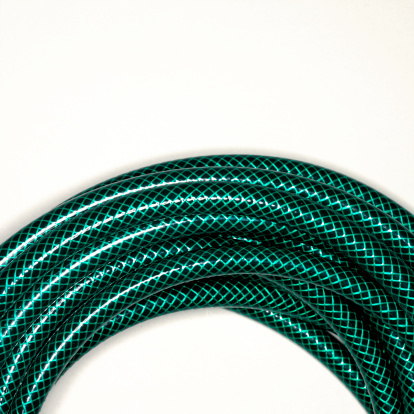 Thickness varies with hose material -- rubber hoses tend to be thicker than vinyl ones. A hose weighs more when it's full of water. A hose is basically a long cylinder, so you calculate the volume by first calculating the cross-section area of the cylinder and multiplying this by its length. While you should measure the inside diameter of the hose to perform the most accurate calculation, you can use a default hose thickness of 1/4 inch for an approximation. Using this value, the inside diameter of a 3/4-inch hose would be 1/2 inch, that of a 5/8-inch hose 3/8 inch and that of a 1/2-inch hose 1/4 inch. The area inside a cylinder is circular, and the area of a cylinder is the square of the radius -- half the diameter -- multiplied by pi, which is approximately 3.14. The mathematical formula is (3.14)•d•d/4, where "d" is the inside diameter. Using this formula, the inside area of a 3/4-inch hose -- with a 1/4-inch wall thickness -- is 0.1962 square inches. Corresponding values for a 5/8-inch and 1/2-inch hose are 0.1104 and 0.0491 square inches, respectively. To calculate the volume of the hose in cubic feet -- which can readily be converted to gallons -- first convert the inside area from square inches to square feet, using the conversion 1 square inch = 0.0069 square feet. You can then multiply the result by 100 feet to arrive at the total volume of water inside the 100-foot hose, in cubic feet. Multiply by 7.48 to convert to gallons. Using these mathematical conversions, you can calculate the volume of water inside a 3/4-inch hose to be 1.01 gallons. The volume inside a 5/8-inch hose is 0.57 gallon, and inside a 1/2-inch hose, there are 0.25 gallon of water. How Much Water Goes Through a Garden Hose Per Minute?